Reason #52,491 that I love Aldi: Seasonal special buys. 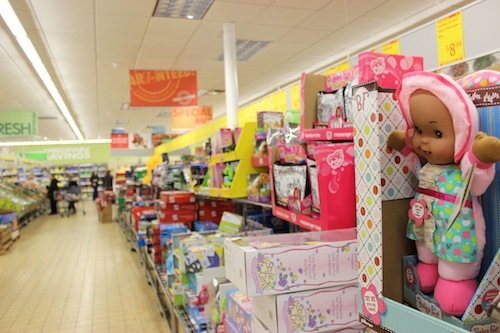 With the winter holidays upon us, Aldi is stocked to the brim with speciality food items, baking goodies and a whole aisle of toys! Today when I went to Aldi to do my weekly produce stock-up, I took some time to check out their special holiday items. Although kosher-keepers can’t partake in Aldi’s holiday meat and speciality cheese selection, I was very impressed with the number of items I found that did have a hechsher on them (looks like I’m going to need to update my Kosher Aldi Database!). And of course, Aldi carries plenty of items that don’t require a hechsher — from paper goods to fresh produce to toys. Aldi’s Seasonal Special Buys are priced extremely competitively, but you can save even more when you shop the Lower Price Red Tags. Nearly all of Aldi’s Seasonal Buys get marked down even more following the “season”. The section below, for example, features post-Thanksgiving goodies for as inexpensive as $.25 (sadly none were hechshered). I plan on visiting Aldi again in the days after Christmas to scope out the markdowns. In my experience, discounts range from 25-75% and the longer something sits on the shelves, the deeper the savings go. Even if you’re not looking for a Seasonal Buy, I absolutely adore the everyday savings in Aldi’s produce section. Sales vary regionally, but at my store today, I was able to snag pineapples for $1.29 and a 3-lb bag of navel oranges for $.99. I’m especially excited to see Aldi carrying more and more organic selections. My store had organic cherry tomatoes, apples, carrots and bananas — and with the exception of the bananas, those items are all on the Dirty Dozen list. As we’ve talked about before, while I can’t necessarily afford to buy all my family’s produce organic, I do try whenever I can to avoid conventionally grown produce for those Dirty Dozen items. Do you love Aldi, too? Perhaps you’d like to try out Aldi for the first time? You can find an Aldi near you on the store locator. #1. Leave a comment on this post telling me what you love about Aldi. If you’re new to Aldi, just let me know that. This comment is required to be entered to win this giveaway. #2. Join the nearly 8,000 people who like Kosher on a Budget on Facebook. Then come back and leave a separate comment on this post telling me that you have done so. If you already like KOAB, thank you — please leave a comment to that effect. #3. Subscribe to the Kosher on a Budget Newsletter for a once daily dose of all the best deals and money-saving tips. Please leave a separate comment that you have subscribed (or were already a subscriber). #4. Follow Kosher on a Budget on Pinterest for lots of pinspiration on everything from kosher slowcooker recipes to Jewish holiday crafts. Please leave a separate comment that you have followed me. This giveaway is open only to residents of the United States who are 18 or older. Entries will be accepted until Wednesday, December 25th at 11:59 p.m. CST. The winners will be selected randomly and notified by email immediately. They will have 48 hours to respond. Good luck! Disclosure: Aldi will provide the winner of this contest with his or her prize package. I was not compensated in any way for hosting this giveaway nor for sharing my (positive) opinions of Aldi. I receive your email newsletter!!!!! I like to go to Aldi – great prices on produce and I’ve found amazing deals on the special buys! I subscribe to the email updates – thanks for all the great deals! Never actually been to aldi but I always see their great prices on the flyers!